This bug can take many forms, and will happen randomly, but the most common way people notice it is when they end up on a form to view/edit a Menu entry instead of the resource they clicked on. The problem seems to stem from a bug in CherryPy, as indicated by Christophe Combelles's analysis (see comments #58 and later). I used the French language when this happenned. I wouldn't reproduced it with english language. It happend since a moment, and I don't know why. Simetimes it works, sometime it doesn't. If can't reproduce the bug, try to restart your browser, and directly go the modules list. Note: It happend will other tree views, not only modules. i've the same problem, in french language too. Are you sure that you are using the latest code as I was unable to get the error in the latest Stable 6.0. Please update your code and notify us if the problem still exist at your end. I confirm what pititi said. I updated right now, stil have the problem. It is really annoying. I wonder that the code is working as expected at my end. Please update all the project and check with the new database. I'm behin an apache proxy, maybe it might be a problem. Is it your case pitititi ? I have not found any such issue in the latest stable 6.0.1. As for now I am closing this bug you can reopen this bug if the issue still occurs at your end. I could reproduce this bug only with OpenERP behind an apache proxy. But I can't say if it's a problem of proxy configuration or not. this bug is reported also with 6.0.1 on my demo server, which is behind a proxy. Some users experiment it every time, some never. Same problem, it seems that it works for me after deleting some openerp cookies from firefox. I am using Dominique's servers for tests so I have no idea of the server config. It seems a cache issue, maybe originated from some old not-working revision. In my tests the bug occurs through the reverse-proxy only. 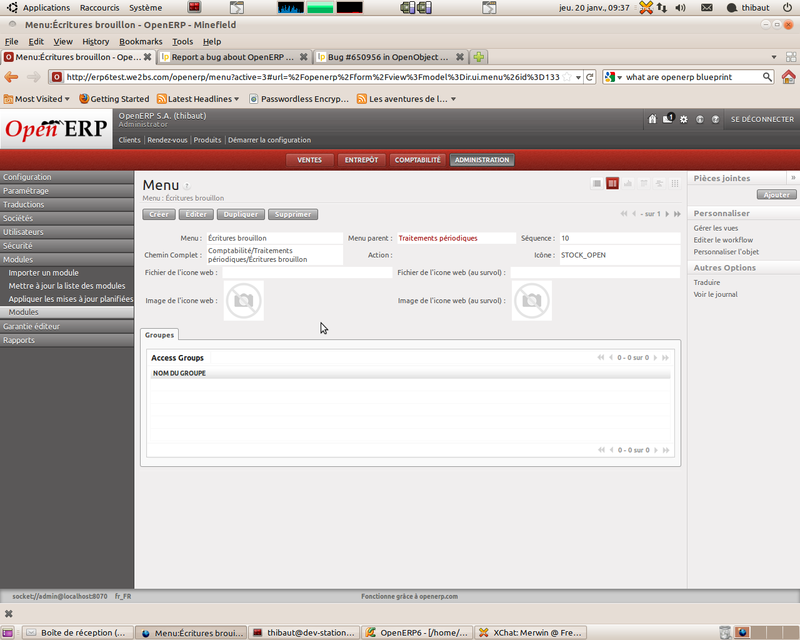 Direct access on the openerp server does not exhibit the issue. Sébastien, Dominique, Thibaut, which kind of proxy setup are you using? Apache? Would it be possible to have an excerpt of your config files? Lorenzo and fred indicate that after clearing out browser caches/data the problem disappears, does it disappear forever or does it reappear later on (to know if it's stale data from a previous version or if it's the client breaking something as it goes along)? I was using a basic apache proxying with mod_proxy, redirecting request to a specified host on the openerp server. We removed the proxy and used apache RewriteRules instead and we didn't had this problem anymore. Unfortunatly, I don't have access to the apache config file. Personaly, refreshing the cache didn't solve the problem when I had it. > Sébastien, Dominique, Thibaut, which kind of proxy setup are you using? > Apache? Would it be possible to have an excerpt of your config files? > the client breaking something as it goes along)? > of a duplicate bug (714451). Tested on new base with demo data and the sales module only: doesn't work sometimes for partner addresses, modules, products... french language. Tracking the defect should be easier now looking at the http request between client/proxy/server in both cases. I have the same problem .. when I press on menu items randomly i got a screen "cached one" for a page not related to the pressed menu item (but related to ir.menu object).. tested on debian 6 and ubuntu... And I am not behind any broxy.. I am using english language.. also following the same steps on the tutorial.. but why all people here installing it behind a proxy? is there a reason behind that? The reason why we install the Webclient behind a proxy, it's to secure it with an SSL certificate. Correct me if I made a mistake, but Webclient Openerp doesn't support https for user interface in native mode. > Correct me if I made a mistake, but Webclient Openerp doesn't support https for user interface in native mode. Xavier, sorry, what do you mean by "user interface in native mode" ? That while theoretically CherryPy's built-in server supports https since 3.0 (requires pyOpenSSL and setting the server.ssl_certificate and server.ssl_private_key configuration properties) I'm not aware of anybody having tested that much (if ever), and that the "supported" method for making a web client accessible via https is to make it sit behind an https proxy. i spent a few hours trying to repro this bug with a simple reverse proxy (similar to Sébastien's), could not repro it so far. I will try again under SSL as I've only been using raw HTTP. Is there anybody reproducing/suffering this bug without using SSL? Since I use the v6 stable, I do not encounter this bug almost over, but it happens sometimes, without any specific reason. We are not using a proxy anymore, but apache mod_rewrite because of this bug in the past, and it never happened with SSL because I didn't use it when I did the bug report. Could this be related to caching ? One way to test would be to force no-cache in the web ui. Were could I force this easily to test on my know-to-be-buggy server ? I tried to repro this again this morning, on four different browsers (Safari, Chrome and Firefox under OSX, IE8 under Win7) using beroz's server (thanks for that) and still didn't manage to repro the issue. > click randomly.. and create a sales order .. then do that for 3-5 minutes..
Do you mean create a sales order then keep clicking for some time, or create a sales order then create more sales orders? If you can reliably trigger the bug, do you think you could take some kind of video of your desktop while doing so? And if you're proficient with your browser's request-introspection tools (Fiddler for MSIE, Firebug for Firefox and Webkit Developer Tools for Safari and Chrome) would it be possible to get the last half-dozen of request/responses until the bug appears? > One way to test would be to force no-cache in the web ui. > Were could I force this easily to test on my know-to-be-buggy server ? For the browser cache, most browser allow you to clear the cache via their preferences (in Chrome, Preferences > Under the bonnet > Clear browsing data… for instance). The Firefox extension "Web Developer Toolbar" also allows you to disable the cache completely (Disable > Disable Cache). For the web client cache, it is not active if the current environment is set to "development". 1. I am following the installation tutorial on openerp documentation exactly, may be there is a step not written and could produce the problem? 2. When I press "configure" the problem become solved... and this is why i thought it is related to cach..
3. When I clear cach it solves the problem, BUT it happens again after some minutes.. Please let me know if you need any more clarification.. or if you have exact steps you need me to try on my testing server..
beroz, thank you very much for the video. i tried following it step by step (though I note that in the screencast the bug seems to be triggered — at least originally — when clicking on [New], not when clicking on a menu item) and was still unable to make it happen (under Win7 using IE8, FF 3.6 or Chrome whatever's the latest, as I note you seem to be using Windows). What happens if you go to the index page (by clicking on the logo in the top-left of the screen) and reload the page by pressing Control+F5 (in firefox, at least), and then try to trigger the bug again? When I do so, it solved the problem.. does that mean it is something related to caching? I've also found this bug many times, sometimes during a customer demo, which is extremely annoying. - DON'T log out, and ask a remote user on a different computer with a different IP address to log in using the SAME admin account. - Ask the remote user to create a lead, or invoice or something. => he should now see the correct wanted form! Do the same the other way around, it's the same. It seems related to the cookies or session. - however I could reproduce it on the same computer using alternatively a wifi connection and a 3G connection both with a different IP address, and with two different browsers. So I've only seen it when two people are remotely using the same account from two different places. The first user that logs in can use it without problem, the second logged-in user gets this wrong ir.ui.menu form until the 1st one logs out. 3. Login to the second machine and press new to any object "sales lead for example".. it will make the problem happen.. So I guess it is a session related issue..
Don't know if it is related but looks like: I tryed to change the dashboards that appears when you clic on top menu (sales...). by web access behind proxy, the dashboards don't change at all, even if you delete the form content. it works with gtk client, or with a local server without proxy. Hmm.. I Also have it problem. I now use two pc. On one pc with "Mozilla/5.0 (X11; U; Linux i686; ru; rv:1.9.1.16) Gecko/20110107 Iceweasel/3.5.16 (like Firefox/3.5.16)" i don't see it and on pc with "Mozilla/5.0 (Windows; U; Windows NT 5.1; ru; rv:1.9.2.17) Gecko/2011 0420 Firefox/3.6.17 sputnik 2.2.0.35" I have it. I'm also affected by this problem from a long time now, ... but I made some progress. Are they any web client expert around? I'm having this problem as well. Very frustrating. In my case both behind a transparent proxy (ISP enforced) and a https reverse proxy (Apache) also tried rewriteEngine vs ProxyPass and some other fixes to CherryPy. It has made the situation better but I still have problems. In my case I simply change the IP of the originating PC and the situation is better. I want to add some more details, which may lead us to solution. When we click on any application menu (say 'Accounting'), it will load all its menu (left accordian) requesting SERVER-PATH/openerp/tree/data. So when, user click on any list item in search-view, DOM operation will get _terp_model's value as ir.ui.menu, which will lead to ir.ui.menu form. Note: 1. This situation will also produce search bug, you will not be able to search on any field other then name! 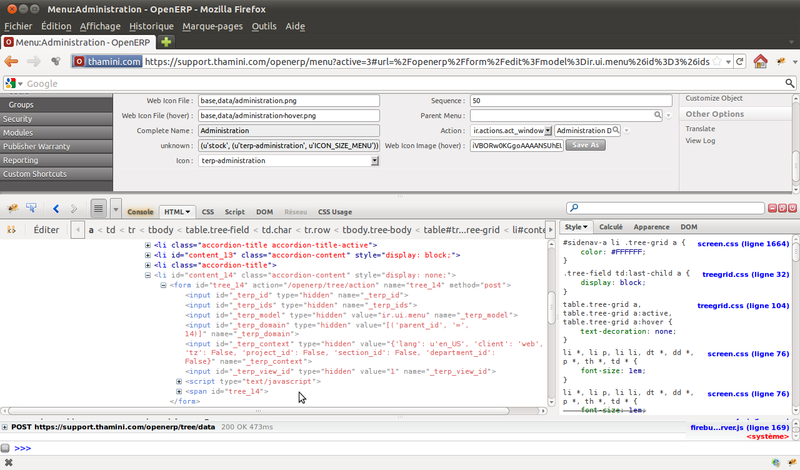 (because name field is avaliable in ir.ui.menu), as model passed in /openerp/search/eval_domain_filter is 'ir.ui.menu'. 2. I observed error mostly occurs when Application Menu has large number if menus. @Xavier ALT, your trace helped me to found the cause, thank you. Excuse me, why "Won't Fix" ? In my opinion this bug is critical. It makes the full web ui completely unusable in an un predictable way. It really deserves some investigation. Totally agree, is completly unusable, at least gives a technical detail to understand where is the problem. I guess that if they have had an idea, they would have fixed the bug. Or they just don't care because of the new webclient ? Because I first reported this bug 9 months ago, and there still have no fix, wheras a lot of people are concerned, and a lot of people explained the problem. This bug just make the webclient totally unusable, I don't understand why you didn't work on this. OK after trying everything for hours, here is my conclusion. Could you please check if I'm right? Changing ProxyTimeout did not change anything for me. But since the real bug is in cherrypy, the best solution is to upgrade at least to cherrypy 3.2.0, or 3.2.2. - change the requirements in the web client's setup.py to : "CherryPy >= 3.2.0" and not "CherryPy == 3.1.2". BTW it's a bad idea to pin egg versions in the setup.py because you prevent people from upgrading. Versions should rather be chosen either manually, or in a pip requirements file, or better in a buildout [versions] section. Thanks for your debug for this bug, but i found a problem. we get some problems in web client using 3.2.x for cherrypy. Would be great read a technical debug from OpenERP developers. Could you tell which problems you have with 3.2.x ? Is there something i should write before it? I've created a branch that fixes the fact that ajax errors fail silently and is the reason we see this kinf of behaviour. Christophe, many thanks for the investigation and detailed analysis, and the suggested patches, this is invaluable! We should be able to reproduce it by forcing a shorter timeout or manually patching CherryPy, and thus properly handle this bug. Maybe instead of raising an error we could implement a workaround to solve the issue for the majority of the people that will find upgrading CherryPy difficult. Perhaps it would be possible to simply perform the request again in case a 408 error is received, as this is really the expected way to handle a 408, even if in this case CP replies to the wrong request. Re-sending the request would also fix the issue of having no response. Of course this doesn't prevent us from suggesting an upgrade of CP and doing it ourselves for the all-in-one packages. Incidentally, this analysis means that the request that gets a 408 would need to be sent a few hundreds of milliseconds after the bulk of the requests have been sent, but not later than that, otherwise the browse will not reuse the dropped persistent connection. This delay could be the result of the synchronous parsing/loading of script blocks, or other similar things. Maybe this is useful to know to reproduce or implement the workaround. > Could you tell which problems you have with 3.2.x ? With 3.2.2 i get problems with encoding. > Drivers, which is subscribed to OpenERP Web Client. > it with english language. > browser, and directly go the modules list. > Note: It happend will other tree views, not only modules. Hello Olivier, there is any news for this bug ? I still can reproduce the bug with 3.1.3 tag from bitbucket and proxy configurations recommended here. This bug is basically an upstream bug that we cannot fix ourselves. for people to test the 3.1.x branch with older versions of Python. So I don't know what version of CherryPy you are testing with. 408 error may be raised by CherryPy, as far as I can tell. perform, to see if you are hitting a different bug. I've tried upgrading to CherryPy 3.1.x from hg repository, yet the error is still occurring for me. Sébastien hint helped me also, previously I was using proxy but on setting parameter ProxyPreserveHost Off solved my problem. Why this bug has not been fixed yet ? See also the bug description for other workarounds you can try if you cannot upgrade CherryPy properly. I'm marking this bug as "Won't Fix" to avoid confusing more people: we can't patch OpenERP to fix it. PS: OpenERP 6.1 and later are not affected at all by this issue. Hello Olivier, as i said in comments before with reported it and apply OPW but nothing happens was never solved. Upgrade cherrypy does not solve the problem and it affects only 6.0. Its not in few cases, it happens always, please check how to reproduce. I can only stress out the points I already mentioned (see also my comment #71 replying to your comment #70): the bug cannot be fixed in OpenERP itself, OPW or no OPW. - It is frequent to have multiple Python versions/environments installed on a single machine, and you may not have upgraded all of them - be sure to upgrade the one that is used by your OpenERP 6.0 Web Client, then restart it! - Watch out: the 3.1.X branch is still labelled "3.1.2" so `pip freeze` and python -c 'import cherrypy;print cherrypy.__version__' will both report 3.1.2 as the version. You can't verify if CherryPy is correctly patched in this way. But you can look at the installed CherryPy source code to see if the changes of the patch linked above are present. - You might actually be seeing a different issue than the one described here. You can double-check: the CherryPy bug will cause requests to be randomly dropped with a 408 HTTP error code - you can easily see this with your browser's debugging tools (e.g. Chrome Developer Tools, Firebug, etc.). If you don't see those 408 errors you might have a different problem.